This was the first group dinner of the trip. And by group, I mean the entire group; we must have had around 70 people and took up the entire lower level of the restaurant! 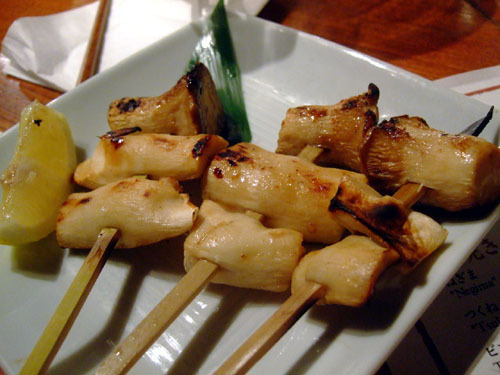 In any case, Gonpachi is an izakaya-style restaurant, which means less formal cuisine such as kushiyaki grilled meats and soba noodles. 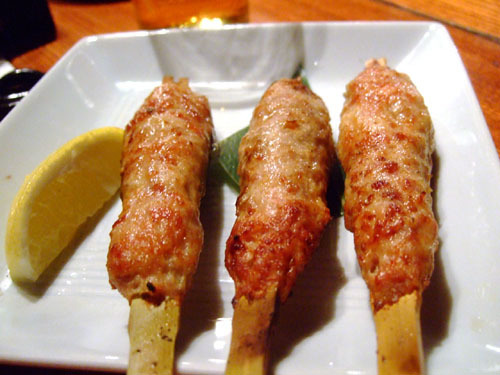 Many izakayas are nomihodai ("all you can drink") or tabehodai ("all you can eat"); Gonpachi was the former. And indeed, we took great advantage of the free-flowing beer and sake, perhaps to excess in some cases. 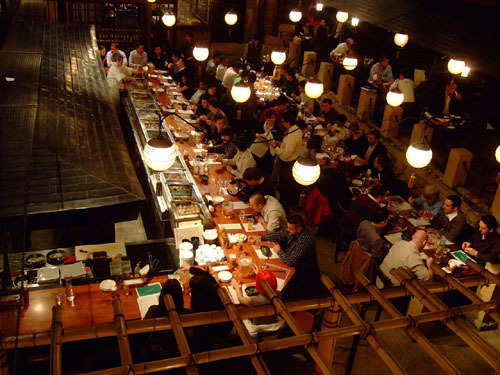 Befitting its atmosphere and appeal to Westerners, Gonpachi is located in the trendy Roppongi district of Tokyo. However, there are other locations in Tokyo, as well as a branch in Beverly Hills. In the first photo, we see my vantage point from the bar. 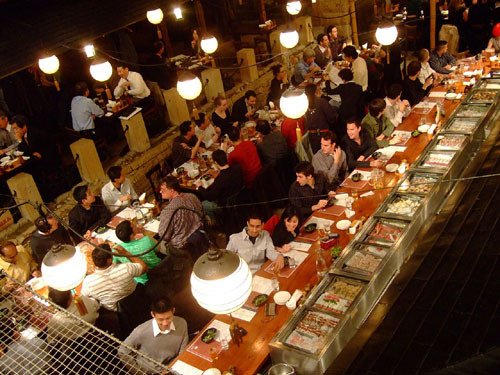 The bar seats around two dozen people, and is surrounded by about a dozen tables. There is also a second floor (from where the bottom four photos were taken), as well as sort of a mezzanine level. 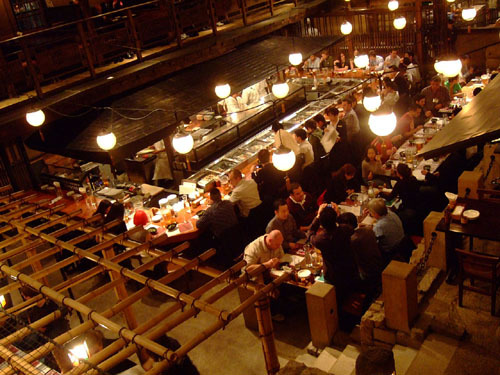 Apparently, the restaurant was the inspiration for the restaurant used for the large fight scene in Kill Bill Volume 1. Since we were such a large group, a set menu was provided. The printed menu also doubled as a placemat. 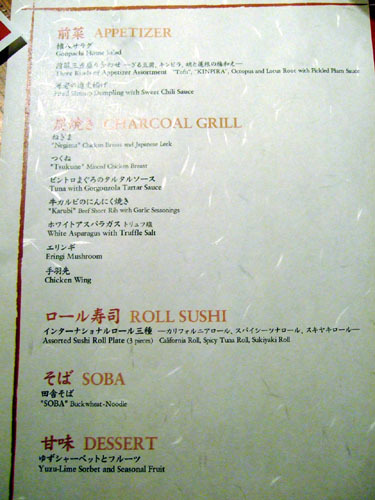 Note that the order presented on the menu is drastically different from the actual order of the dishes received. 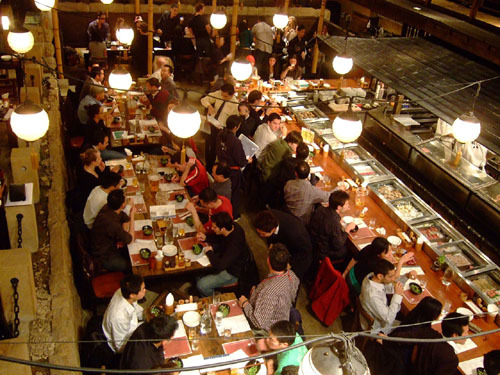 The restaurant probably had difficulty simply dealing with the sheer number of people. Click for larger version. 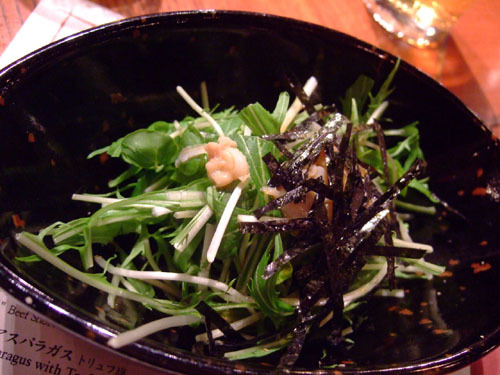 Mixed greens topped with nori and what I believe was clam. Any dressing was either absent or very minimal. I'm not quite sure what the veggies were, but they were slightly bitter and not particularly tasty. 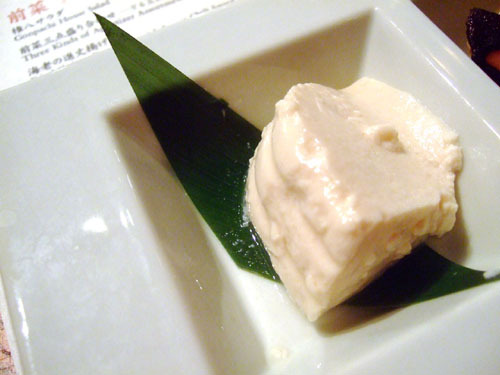 • Tofu - Extremely soft and creamy texture, with a nondescript flavor. • Octopus and Lotus Root with Pickled Plum Sauce - Quite good, with the taste of the crisp octopus pieces melding nicely with the sweet sauce. 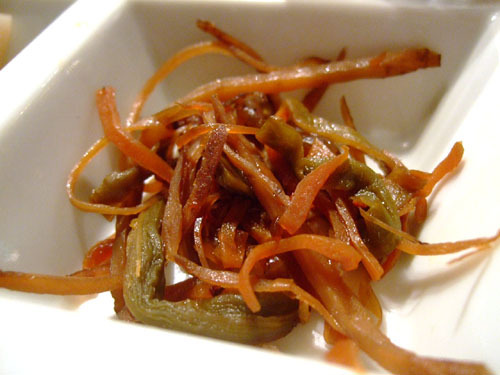 • Kinpira - Kinpira refers to a Japanese cooking style of sautéing and simmering that is commonly used to cook root vegetables, among other items. 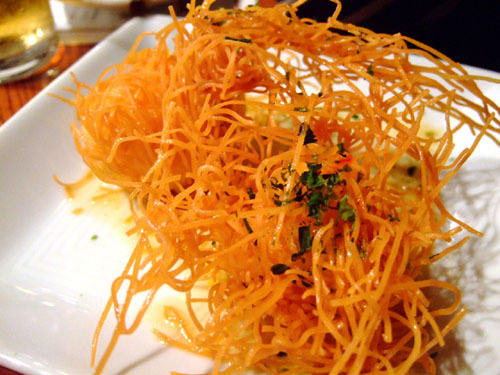 In this case, it looks like burdock and carrot was used. Overall, I felt this had an almost pickled taste, which I did enjoy. 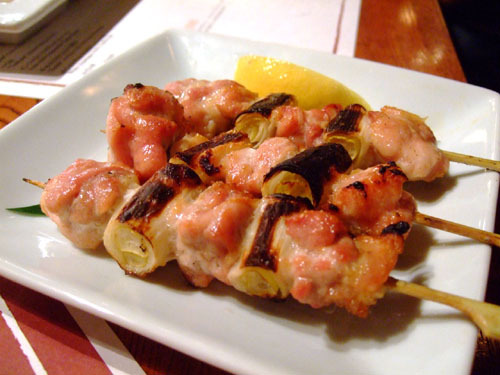 “Negima” I believe specifically refers to the combination of chicken and leek/scallions. In this case, I found the chicken to be very tender and well cooked, with a slightly smoky flavor; meanwhile, the leek provided a sharp, slightly bitter contrast to the meat. The lemon added an interesting twist, but wasn't necessary. One of my favorite items of the night. The tuna was far overcooked in my opinion. The meat was left rather dry, without much flavor. The tartar sauce, thus, was much needed. This further reinforces my belief that tuna is best left raw/rare, save for exceptional cases (e.g. the maguro "spare ribs" at Kyubey). 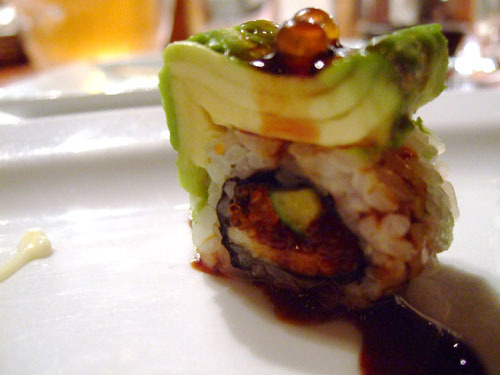 • Spicy Tuna Roll - This seemed like something you might see with supermarket sushi. Not spicy at all, but good enough. 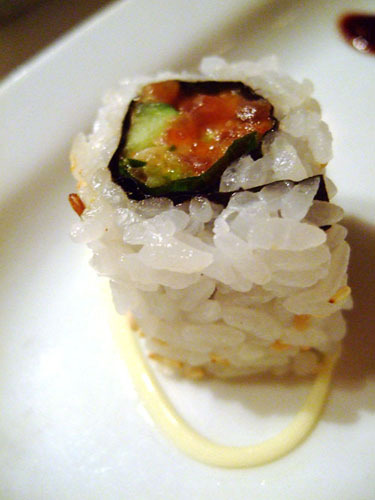 • California Roll - Fortunately, this was a bit different than the California Rolls we get Stateside. 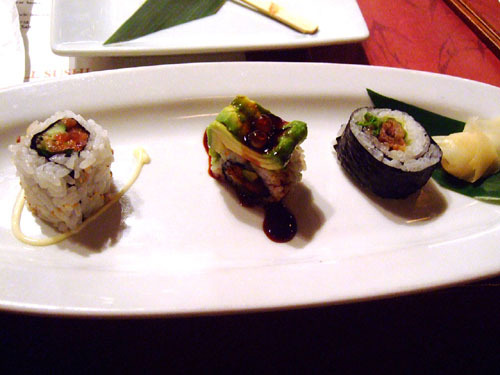 I didn't detect much imitation crab, though the avocado did tend to dominate the flavors. 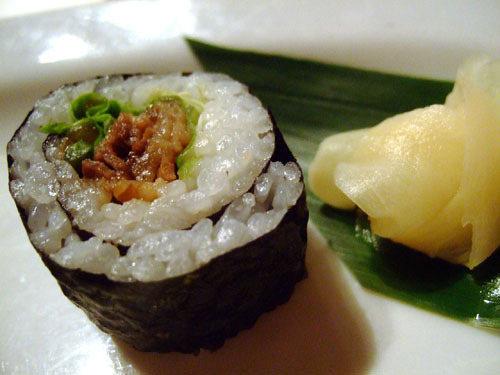 • Sukiyaki Roll - The combination of cooked beef, lettuce, and rice worked rather well for me. 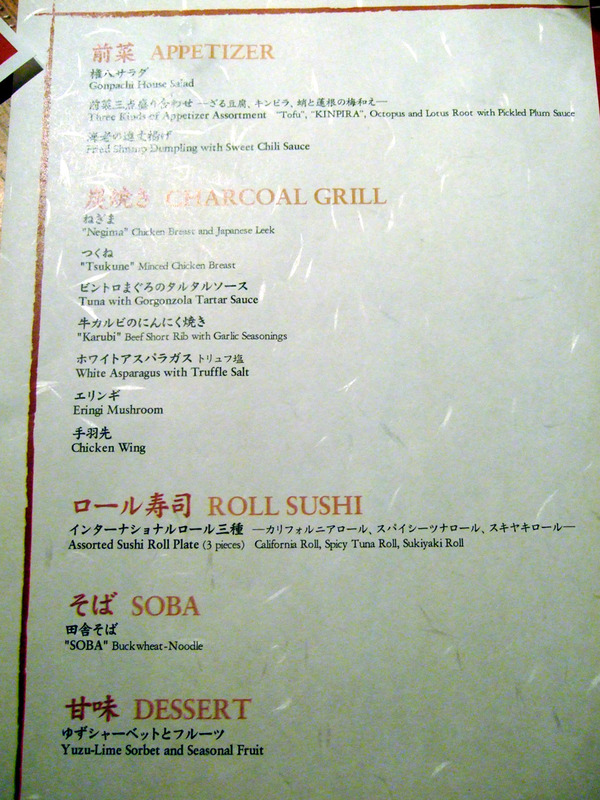 Overall, I'm disappointed that no "real" sushi or sashimi was offered. I suppose given the large group, the food had to be "dumbed down," so to speak. The dumplings were particularly difficult to eat given the "spines." But once I was able to bite into the meat, I did rather enjoy them. These almost seemed like they could be Chinese dim sum items. I'm not a huge fan of asparagus in general, though it does seem like I have a preference for the white variety, à la Spago. Again, I did enjoy these, especially how the slightly charred exterior surrounded a still juicy inner flesh. 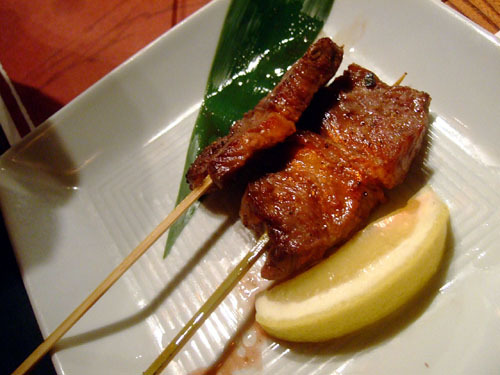 Karubi is a Korean-inspired style of making beef involving the marination and then grilling of short ribs. 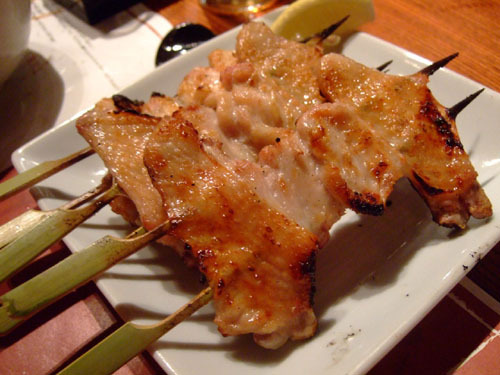 The word itself is actually derived from the Korean "galbi." Unfortunately, I felt the meat was a bit overdone (and thus tough), and perhaps a bit too sweet. 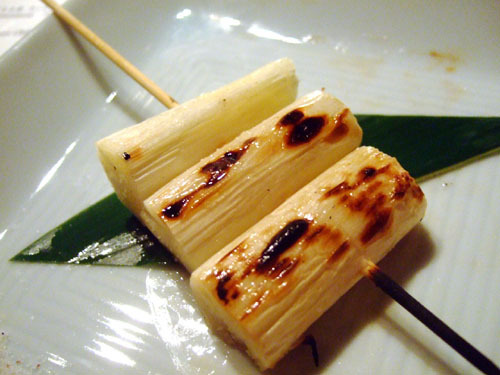 Eringis are also known as king trumpet mushrooms or king oyster mushrooms. The flavor of the flesh itself was mild, so the smoky flavor imparted by the grill was a welcomed addition. Overall, one of the stronger dishes of the night for me. Served cold, with onion and wasabi. 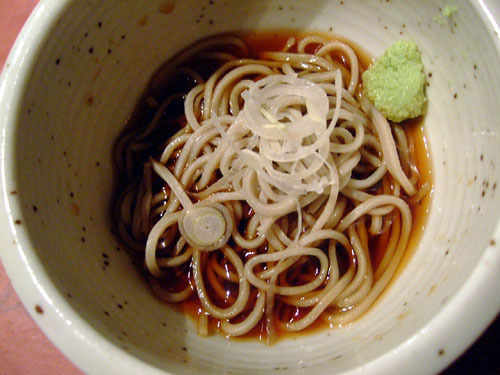 The dipping sauce, or tsuyu, was a mixture of dashi, soy sauce, and mirin, and really brought out the character of the noodles. Very nice. This was the weakest chicken course for me, though still quite palatable. Unlike the negima above, the meat here was tougher and drier than I prefer, while being less flavorful. Texture-wise, the meat was juicy and tender enough. But I thought these had a slightly odd, almost sour taste that was slightly disconcerting. Grape, Strawberry, Pineapple, Orange, Grapefruit. 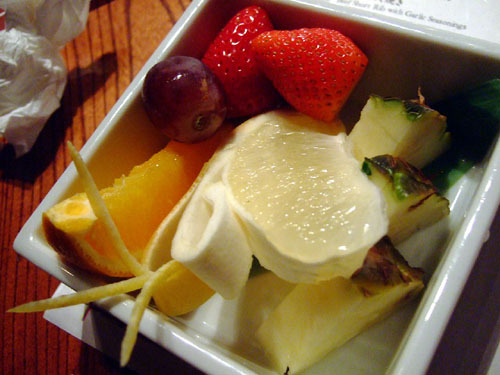 A nice selection of fruit to close out the meal. All the items were very sweet (especially the grapefruit) and thus quite delicious. I usually think of sorbet as having a creamier consistency. 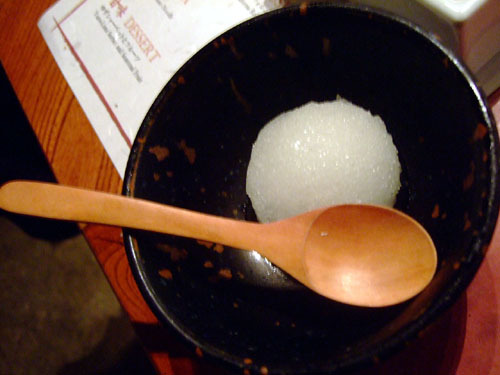 This was more akin to yuzu-flavored ice, almost like an Italian ice or granita. A bit too bitingly cold for me. 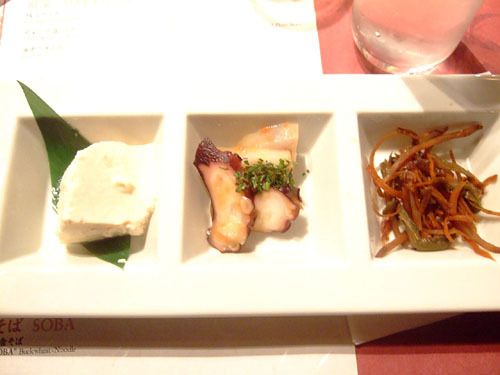 Overall, Gonpachi was an enjoyable, though unexceptional, meal. I did feel like some of the food was meant to appeal more to "Western" tastes, though I admit I'm not really well versed with regard to izakaya food, so perhaps I just need to temper my expectations. Fine dining Gonpachi isn't, but for what it is, it succeeds in my opinion. With that said, I wouldn't mind trying the Beverly Hills location, though I'd be careful what I order. 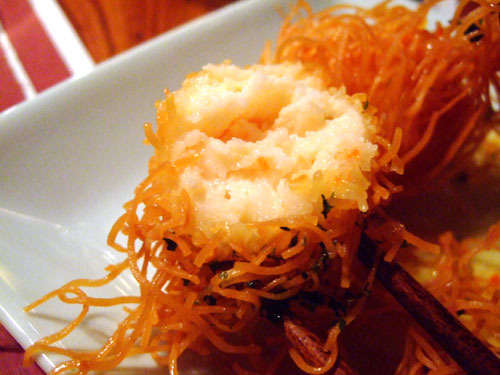 Having made the minced prawn version of the “Tsukune” Minced Chicken Breast (i.e the chao tom at Brodard if you are wondering what it is)I think I know why it tasted sour. It is the sugar cane. Sometimes sugar cane from the can is slightly sour and contaminates the 'meat' which is unfortunate since the original intention of the sugar cane was to sweeten and add flavour to the meat... it took me ages to figure it out I thought I had put something funny into the minced prawns!!! I mean who would think that sugar cane is sour right? Thanks for the tip. I do really like the chao tom at Brodard though! 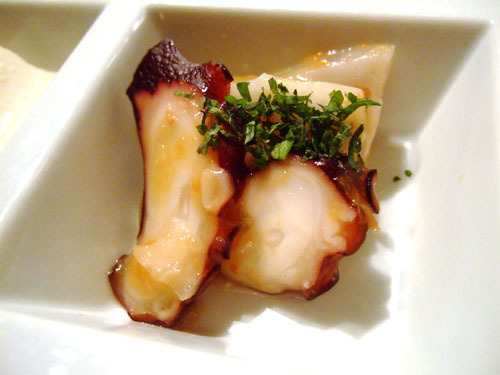 was your trip to japan a culinary tour or were you there for something else and chose these restaurants? 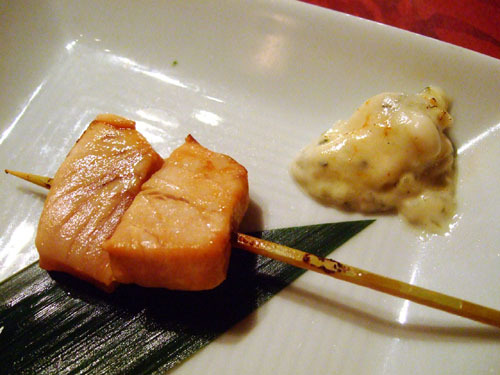 what's your opinion on mixing wasabe with soy sauce into a slurry when eating sushi/sashimi? The trip was for school, as I wouldn't have come here otherwise. The "slurry" method is generally frowned upon, and I don't do it myself. hRandomly just stumbled upon your blog and saw this post for Gonpachi. Your comments are interesting, haha. Gonpachi is a 100% tourist attraction, basically all decor and not much else. The food is pretty weak and the service is terrible. 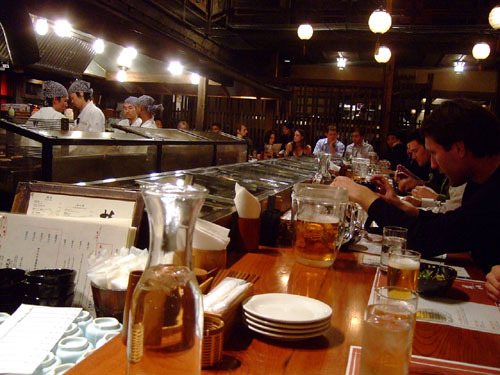 It's the kind of place a visitor or newcomer to Japan might enjoy but a real foodie should steer clear of. Abram, I think you pretty much hit the nail on the head. 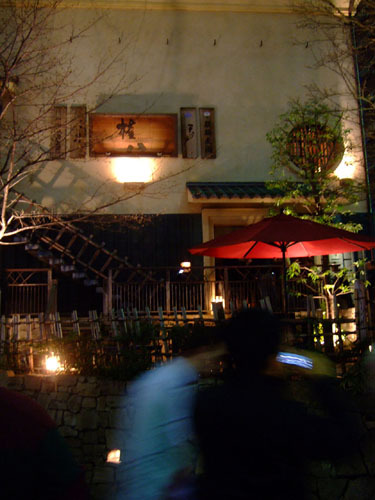 We needed a place where a big group of visiting students could get drunk, so Gonpachi fit the bill nicely. BTW, their Beverly Hills outpost closed recently--no surprise there.